Anil Seth: How Does Your Brain Construct Your Conscious Reality? Anil Seth on the TED stage. When we look around, it feels like we're seeing an objective reality. But neuroscientist Anil Seth says everything we perceive, from objects to emotions, is an act of informed guesswork by the brain. 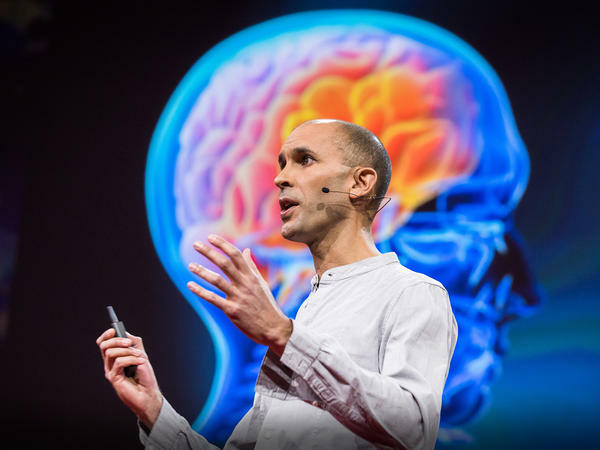 Anil Seth is a professor of cognitive and computational neuroscience at the University of Sussex, where he studies consciousness and its role in health and disease. He co-directs the Sackler Centre for Consciousness Science and is the Editor-in-Chief of the academic journal Neuroscience of Consciousness. Seth was also the 2017 President of the British Science Association (Psychology Section). He is the co-author of 30-Second Brain, a best-seller that explores how the brain works. Seth is a regular contributor to the New Scientist, The Guardian, and the BBC. On the show today, what makes us us. Can you explain what it means to be conscious? Like, what is it? ANIL SETH: Consciousness is the most familiar thing for any of us. I mean, we all know the difference between being conscious and not being conscious. RAZ: This is Anil Seth. He's a professor of neuroscience at the University of Sussex in the U.K.
SETH: Consciousness is any kind of experience at all, whether it's a visual experience of the world around us, whether it's an emotional experience of feeling sad or jealousy or happy or excited. From experiences of intending to do something or being the cause of something that happens, consciousness is the word that we use to circumscribe all the different kinds of experiences that we can have. I think, to put it most simply, for a conscious system, there is something it is like to be that system, whereas for something that isn't conscious, there isn't. RAZ: And how consciousness even happens and if we can recreate it artificially is a question that we're still trying to figure out because what's more fundamental about being a human than knowing we exist? Anil Seth explains more from the TED stage. SETH: Answering this question is so important because consciousness, for each of us, is all there is. Without it, there's no world, there's no self, there's nothing at all. And when we suffer, we suffer consciously, whether it's through mental illness or pain. And if we can experience joy and suffering, what about other animals? Might they be conscious, too? Do they also have a sense of self? And as computers get faster and smarter, maybe there will come a point, maybe not too far away, when my iPhone develops a sense of its own existence. Now I actually think the prospects for a conscious AI are pretty remote. In the story I'm going to tell you, our conscious experiences of the world around us, and of ourselves within it, are kinds of controlled hallucinations that happen with, through and because of our living bodies. RAZ: I love this idea of a controlled hallucination. Is that what we experience? Is that how we experience the world - that it's a controlled hallucination? We're just, essentially, hallucinating all the time? SETH: I love this phrase. I wish I could take credit for it, but I can't. But I love the phrase because it points out that everything that we perceive - consciously or unconsciously, but let's talk about consciousness for now - is a construction of the brain. I mean, it's easy to think that we open our eyes and objective reality is revealed to us through the windows of our eyes. RAZ: I'm at a baseball game. There's the batter. There's the hit. UNIDENTIFIED BROADCASTER: And he's going to pull this one to right. RAZ: That's real. That's reality. UNIDENTIFIED BROADCASTER: It's going deep. See you later. SETH: That's right. But the truth is that all perceptions are acts of interpretation. They're acts of informed guesswork that the brain applies when it encounters sensory data. I think the way I can think of this is that there is no light in the skull, and there's no sounds. All that's going on in the brain are electrical impulses whizzing around in complex patterns. And out of all this - all this pattern-making in the brain, a world appears. And in some sense, we've known this for a long time. So since Newton, it's been pretty clear that colors - red, yellow, green, et cetera - colors are not objective properties of objects in the world. They are attributes of reflected light. And the brain - the visual system will make inferences based on wavelengths of light about what color something is. So something as basic as color is not something that we just passively receive from the world. We actively attribute it to things out there in the world. And the idea of controlled hallucination is just that, well, this applies to everything. I mean, this applies to everything that we perceive, and not just perceptions of things out there in the world, but also, it applies to our perceptions of our self, of our body, of our memories, of our sense of agency, of our sense of volition - that everything that we perceive is a construction. But it's not a random construction. It's construction - it's a best guess that is reined in by the sensory data at all times, which is why most of us agree, when we look at a table, that we will say, yeah, I see a table, you see a table and we both see the same thing. And that's because these aren't just random constructions. They're constrained by the sensory data that we get. And that's why, I think, the term, controlled hallucination, is very appropriate. SETH: Here's one more example which shows just how quickly the brain can use new predictions to change what we consciously experience. Have a listen to this. SETH: Sounded strange, right? Have a listen again and see if you can get anything. SETH: Still strange. Now listen to this. COMPUTER-GENERATED VOICE: I think Brexit is a really terrible idea. SETH: Which I do. So you heard some words there, right? Now listen to the first sound again. I'm just going to replay it. SETH: Yeah? So you can now hear words there. Once more for luck. SETH: OK. So what's going on here is - the remarkable thing is the sensory information coming into the brain hasn't changed at all. All that's changed is your brain's best guess of the causes of that sensory information. And that changes what you consciously hear. Now all this puts the brain's basis of perception in a bit of a different light. Instead of perception depending largely on signals coming into the brain from the outside world, it depends as much, if not more, on perceptual predictions flowing in the opposite direction. We don't just passively perceive the world. We actively generate it. The world we experience comes as much, if not more, from the inside out as from the outside in. RAZ: How much agency do we have over our consciousness? Like, is it a fixed thing, or are we able to shape it? Can we actively shape it? SETH: I think this gets, really, at the heart of what people think about when they think about the essence of themselves. SETH: And I find this when talking about consciousness to people in general. You can give them an explanation of, you know, the fact that colors are constructions, and people are happy with that. You show them optical illusions and so on. They're happy with that. Then you can tell them that your experience of what is your body is also a construction and give some evidence for that. And, yeah, people - OK, fair enough. SETH: ...At least, of some of them. And of course, that's what the experience of relation is useful for. It's useful for this thing that is my organism to distinguish those actions that are relatively internally caused from those that are relatively externally caused. So everything that I do. You know, one extreme is I put my hand on a hot stove and I retract my arm without even realizing it. That's a reflex. That's an externally driven action. It would be wrong to experience that as volitional. But my experience of coming to the studio this morning to record this was highly volitional. You know, I decided to do it. And I got in the cab, and I came here. SETH: And that's very useful to distinguish these different kinds of actions, but it doesn't mean that the experience of volition caused the action. And this doesn't mean that volitional behavior doesn't exist. Of course it's a thing. And every action that we experience as voluntary is shaped by our whole history of previous voluntary actions that we've executed during our lifetimes of our social and cultural context, of our developmental and even our evolutionary heritage, indeed. All of these factors play in to every action that we do, whether we experience it as volitional or not. RAZ: So I mean, the thing about consciousness is, that's what makes us us, right? Like, that's what makes us human. But there are a lot of people in the world who believe that we are not that far off from, like, AI becoming conscious, right, and behaving and responding and thinking as we do. SETH: We see this Prometheus. We see this with "Terminator," we see this with "Blade Runner," in very different ways. You know, I love "Blade Runner." I'm a bit frustrated by the "Terminator" view of future technology and robots. We see this in the beautiful film, "Ex Machina," which I think really interrogates the philosophical issues behind this in a hugely interesting way. But yeah, there's this cultural trope that intelligence and consciousness go together and that AI will develop awareness at some point. The other factor that's playing into it - and this is the one I think is perhaps a bit more damaging - is what I have come to call a pernicious anthropocentrism. And this is the idea that, you know, we humans, we think, well, what's special about us? We're always trying to find out what's special about us. Maybe it's not that we have a soul and other animals don't. Well, maybe it's that we're intelligent. Maybe we have minds that are somehow different, an order of magnitude different from the minds of other creatures or of objects. It's intelligence that sets us apart and makes us special. And we're also conscious. So there's this tendency we have to associate these two things together. Well, you know, we're intelligent and we're conscious. So intelligence and consciousness should go together. But, actually, that really doesn't have to be the case. You certainly don't have to be very intelligent in order to experience pain and suffering. And so we can imagine that there are plenty of other animals that may not score very highly on our very human-centric measure of intelligence that nonetheless have vivid conscious experiences. So to me, these things weigh against the idea that AI is headed on an inevitable trajectory towards being conscious. But yet it's certainly possible that the near future we'll see as being able to build artifacts that give the impression of being conscious. And that to me picks out a very interesting space of the future. What will happen to our interactions with each other and with other animals when our environments are populated by things that give the appearance of being conscious and of being intelligent but for which we have no way, really, of knowing whether they are or not, or certainly no confidence in saying that they are conscious? Is that going to change the way we behave to things that are actually conscious? I think that's definitely a worry. RAZ: Anil Seth. He's a professor of neuroscience at the University of Sussex. You can see his full talk at ted.com. SPRITES: (Singing) Why sell yourself short when you can have everything that you want? I'd like the mind of a brilliant man, please. I'll take the wings of a hummingbird. They say DNA makes us who we are. Give me jellyfish genes so I can glow in the dark. RAZ: Hey. Thanks for listening to our show this week, What Makes Us Us. If you want to find out more about who was on it, go to ted.npr.org. To see hundreds more TED Talks, check out ted.com and the TED app. Our production staff here at NPR includes Jeff Rogers, Brent Baughman, Meghan Keane, Neva Grant, Sanaz Meshkinpour, and Casey Herman, with help from Daniel Shukin. Our intern is Rachel Faulkner. Our partners at TED are Chris Anderson, Kelly Stoetzel and Janet Lee. I'm Guy Raz, and you've been listening to ideas worth spreading, right here on the TED Radio Hour from NPR. Transcript provided by NPR, Copyright NPR.